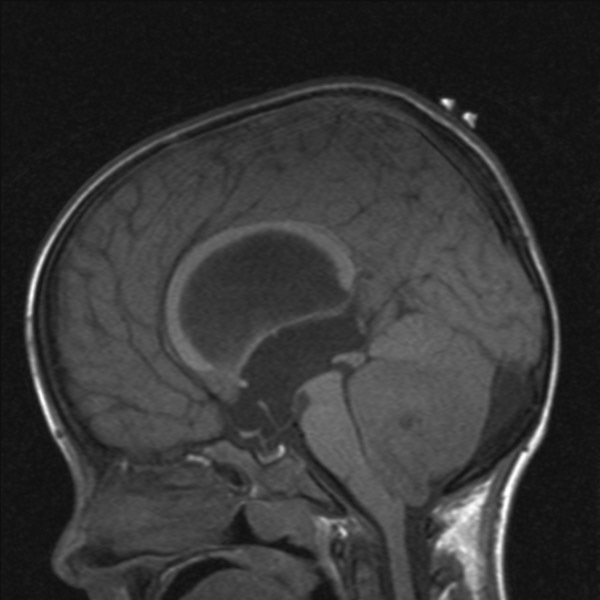 Posterior fossa tumors are the commonest CNS tumors in childhood, accounting for 50–60% of all brain tumors. The incidence of hydrocephalus in children with posterior fossa tumors at the time of presentation varies in different series between 82% and 91%. It is considered to be caused by obliteration or significant compression of the fourth ventricle by the tumor. The incidence of hydrocephalus requiring surgery for permanent CSF diversion after treatment of the tumor is much less, around 25–35%, and depends on the type of the tumor and consequently the type of treatment for it (5, 7, 23). Tumor is primary target: The optimal treatment would be total tumor removal and resultant permanent subsidence of hydrocephalus without neurological deficits. Timing of management dependent on presentation: If hydrocephalus is causing dramatic clinical deterioration at presentation, it should be treated before tumor resection. In most patients, however, hydrocephalus, while present, is not causing acute clinical deterioration. Hence, definitive surgical treatment can be left until after tumor resection in the hope that resection of the tumor will alleviate the hydrocephalus. ETV preferred over shunt: ETV as a first treatment option is more justified than shunt insertion.